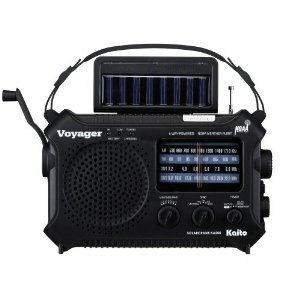 Solar Panel–the KA500 is one of the only portable shortwave receivers out there with a built-in solar panel. The panel is effective enough that it will power the radio (if in direct sunlight) without batteries and produce a reasonable amount of volume through its built-in speaker. The 5 LED reading lamp — This reading lamp is impressive. If the batteries are fully charged, the lamp works for VERY long periods of time. I’m also an amateur radio operator and found that the reading lamp is bright enough that it lit up my large radio table. Good shortwave sensitivity — For a self-powered analog radio, I was impressed with the shortwave sensitivity. I also found the AM broadcast and FM bands adequate/average. Good selectivity — When a station is tuned-in well, you don’t often hear adjacent signals. Quality — Though the radio feels solid in your hand, I found through my testing that the quality of the KA500 is actually quite poor. More than once, the tuning mechanism would slip and the needle would get stuck in the middle of the dial. The worst part, though, is the poor quality of the hand-crank mechanism. The dynamo and crank arm feel cheap. Well, they are cheap. After only a month of occasional testing–and with me being very careful with the hand crank–the dynamo started showing signs of failing. The crank became less fluid to turn and would rub the side of the radio chassis. One day, while slowly cranking, the crank arm just snapped in half. No more crank power. No Fine Tune control — Kaito fits the whole SW1 and SW2 spectrum on a small dial. There were a few times I wish this radio had a fine tune control like the Grundig FR200. I sent my KA500 back and did not get it replaced. It’s a shame, really. I loved the radio’s features and overall performance, but was very disappointed with quality. I could only recommend this radio to someone who plans on tucking it away and using it on rare occasions or someone who wants a basic full-featured radio but never plans on using the hand-crank. I’d also keep the receipt handy for the return (and buy from an authorized dealer like Universal Radio). For my purposes, I will be using the Grundig/Etón FR350 and the FR200. The difference in quality between these and the KA500 is night and day. The Grundigs/Etóns are very rugged, water resistant and time tested. The crank arms are made better and even after long-term use, continue to function properly. They’re simply designed and tested better (before hitting the retail shelf). Sure wish Kaito would work on the quality of the KA500, they’d have a very competitive product. This entry was posted in Reviews and tagged Emergency Radios, Kaito KA 500 Review, Kaito KA500, Self-Powered Radios, Shortwave Radio Reviews on December 15, 2008 by Thomas.